Thanks to the size of the pen, application really is simple. You can get a great grip and therefore a nice, smooth line. The nib is quite big and because of this you can create different line widths depending on the amount of pressure you apply. With more pressure, you can create a thick line like the one on the left in the above photo. A small amount will create the line in the middle, and being gentle will create a thinner line like the one on the right. This means that the eyeliner is quite versatile and can be used for a range of looks. I really love the finished look of this eyeliner. You can create cat flicks or have simple, thinly lined eyes, whatever takes your fancy can be had. Well, except for waterlining. That won't quite work as it's not waterproof. However, I personally struggle to get any lasting power out of it. For reference, I have oily skin, and therefore oily eyelids. This is a problem that I am used to and I have found good eyelid primers that I personally get on well with for long-lasting results with whatever eye looks I go for. Even when I use my favourite primers though, I just can't seem to get this eyeliner to stick around. It transfers as well as smudges. It goes quite patchy and instead of a smooth black line it becomes a messy, faded grey. In contrast, when applied to the back of the hand, it doesn't budge. It's great, you can rub your finger over it and it doesn't fade or smudge. With that said, when reading through some other reviews for this product, people with normal or dry skin - or at least those who don't have oily eyelids - seem to get on well with this. Maybe it is heavily dependent on the primer that you use and your skin type, I’m not 100% sure, but there definitely seems to be a mix bag of opinions. I don't dislike it, but if you also have oily skin, it's definitely worth keeping in mind that you may encounter some issues. If you have normal skin though, you may get on really well. 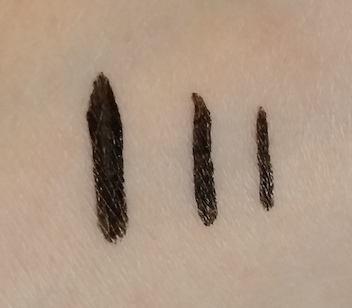 I'm not giving up on Eyeko's Fat Liquid Liner. The simplicity of it makes it a very compelling choice and seeing how well it stays put on the back of the hand gives me hope that with some more testing with different primers, there may be some harmony to be found. You can purchase the Eyeko Fat Liquid Liner for £12.33 from Asos. 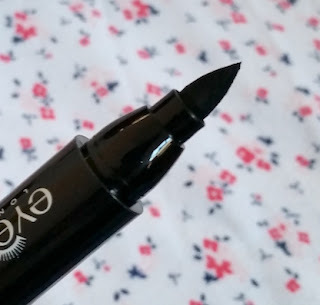 What are your thoughts on the Eyeko Fat Liquid Liner? Have you had any similar problems?